Shortly after Salesforce CEO Marc Benioff hired ex-Oracle exec Keith Block in 2013, he called him "the best sales executive" in enterprise software history. Fast forward three years, and it looks like Benioff wasn't kidding. Under Block's watch, Salesforce has signed more large enterprise deals than ever and continues to expand into new industries, turning itself into one of the largest business software makers in the world. "Salesforce's push into larger enterprises really began with the hiring of Keith Block in 2013," Pacific Crest's Brent Bracelin wrote in a note published Wednesday. "The growing number of large deals and size of large deals has been a boon for Salesforce." In fact, Salesforce has been signing big deals at a record pace, and now has roughly 1,300 customers that are under contracts worth $1 million or more. That's a 30% jump from last year, and a 2.6-times increase from the second quarter of 2013, according to Pacific Crest. On top of that, the number of companies spending $10 million or more on Salesforce has grown 47% year-over-year, and 7.6-times since the second quarter of 2013, Pacific Crest notes. The company has signed at least four $100 million-plus deals over the last four quarters alone. 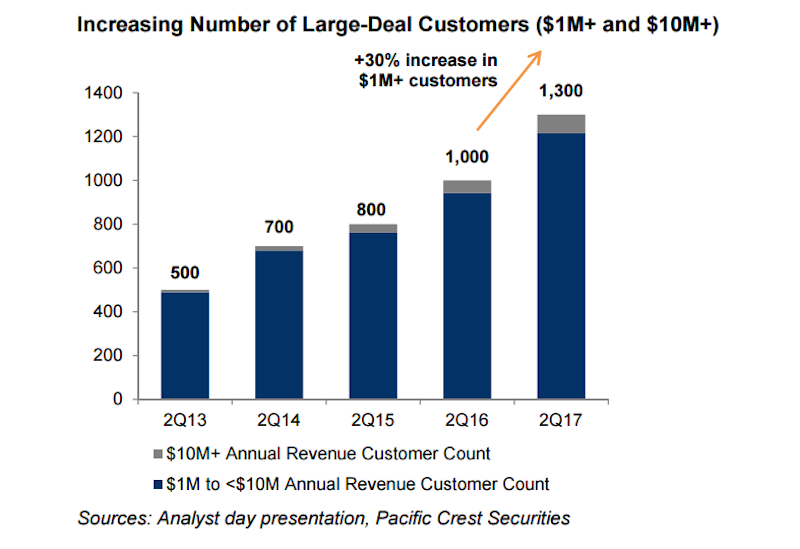 Although there are a lot of different reasons for Salesforce's success, Pacific Crest notes Block was a key factor. Block now runs Salesforce's global sales, customer support, and consulting services organizations, and has played a major role in helping the company get into specific verticals, like finance, healthcare, and government sectors. It's no surprise he holds three different titles at Salesforce (President, COO, and Vice Chairman). And Benioff is making sure Block gets financially rewarded as well. In addition to paying him roughly $12 million in total compensation, Salesforce gave Block a watch worth $41,000 last year, in recognition of his "leadership."